“Glued to his village,” was the way Wilson Tembo, Executive Director of Action for Progress described Charles Mpunzeni from Chitera Village in October 2017 (See his story https://www.malawiproject.org/glued-to-the-village/ ). Charles had been unable to walk since birth. In spite of his disability he had been able to grow to adulthood, marry, and father four children. The irony of his profession was not lost on this 47-year-old husband and father. In spite of his inability to walk, Charles served as the village shoe repairman. 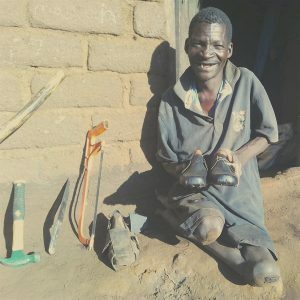 The problem with his vocation rested in the fact his village consisted of only a few families, too few in fact for him to make a living repairing their shoes. The nearest trading center was too far away, and the only wheelchair he had ever possessed had long since broken down, with no way to repair it or obtain a new one. When Wilson met Charles and delivered one of the shiny, brand new, mobility units, it opened the opportunity for Charles to reach the nearby trading center and set up his shoe repair business. The added traffic gave him new, and exciting opportunities to grow his business. Only one thing remained in the way of success; the needed capital for supplies and equipment. Learning that amounted to only $92.00 the funds were immediately made available. A little over a year later Tembo looked in on Charles. He reports the success of this talented shoe repairman, now able to support his family through the efforts of Mobility Ministries, the Malawi Project, as well as from generous supporters in the U.S.
Charles is pictured here with a big smile.